Charles de Varigny : "Jeux Havaiens", circa 1874. "Quatorze Ans Aux Iles Sandwich (Iles Havai)"
by Emile Bayard (page 224) and by de E. Riou (page 237). Dela Vega (ed, 2004) Page17. Librairie Hachette, Paris, 1874. iii 350p. Later he was an advisor to the King Kamehameha V, Minister for Finance 1864 and then Minister for Foreign Affairs 1865-1868. I have been unable to determine the location of the report. I assume the text in brackets has been added by the translator to improve explanation. There only a reference to the board's light weight, and no account of the board's other features or dimensions. The author notes the decline of surf-riding activity, similarly to Knox : Surfing at Hilo, circa 1888. 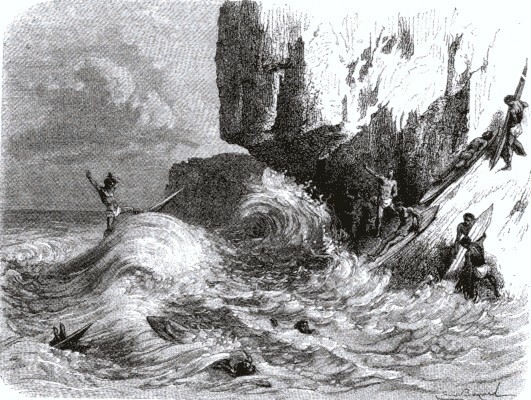 With judicious reading, the article appears to imply that the rider slides diagonally across the wave face, and furthermore it could be seen as the first report of a "tube-ride", see Note #8, below. The two accompanying illustrations are probably reconstucted from the author's text, field notes, sketches and/ or verbal input. 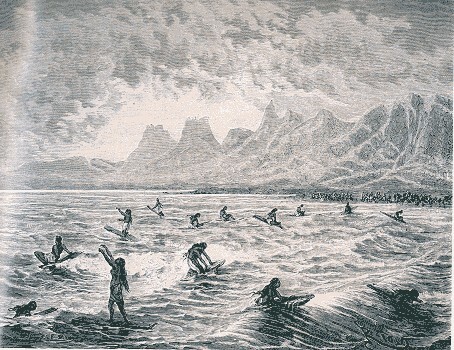 It is unlikely the artists witnessed surf-riding in Hawaii, see Notes #11 and #12. Riou's image has a significant inconsistancies. "... In the instant there-after, he reappeared on the surface of the water (2), and, using his hands like two oars, he directed the point of this "canoe of a new genre" (3) toward the growing (swelling) wave. One could see him then rising on the crest of the waves, descending again, and climbing anew. Defiant of danger, natural forces and performed in cold blood were their main attractions. The chiefs (masters) excelled at these exercises but now there are few traces of the games left. Digitally collated and formatted from ..
1. Le Tour du monde was a French Magazine. 3. "canoe of a new genre"
A surfboard of indeterminant dimensions. 4. "After gaining a certain distance from the, beach, he scanned the horizon until a wave stronger than all the others loomed." 5. "while upright atop the board." The rider was in a standing position. 6. The smallest movement would make him capsize. Precise technique was required to avoid a wipe-out. 7. the board itself was one with the surf. Probably an attempt to describe the transverse motion of the board in the curl. 8. "The foam enveloped him, one could see only the outline of his body, and he moved forward with the spray without directing from a straight line and without staggering." a. The ride was directly to the beach (which is not reported by similar accounts) and the rider was "enveloped" by the white water. b. Following from 7 above, if the ride was transversed the wave face, then from a contempoarary perspective, it is almost impossible to read this sentence without considering that the writer is attempting to describe what is commonly termed a "tube ride". 9. ".. all of the old games"
Other games included land sliding, ?? 10. "... there are few traces of the games left"
12. "Edouard Riou (1833-1900) is the first and undoubtedly the most recognized illustrator of Verne’s Voyages Extraordinaires. This is probably a failure in understanding by the illustrator. Geoff Cater (2006) : Charles de Varigny : Jeux Havaiens, 1874.